"Is the government declaring war on them?" Neon has launched the first official US trailer for a Japanese sci-fi drama titled Before We Vanish, which played at Cannes Film Festival and New York Film Festival last year and many other fests. The premise is rather peculiar - three aliens travel to Earth to prepare for an invasion, and take possession of human bodies. In doing so, they only leave hollow shells of these people, which start to become noticeable to those around them. The cast features Masami Nagasawa, Ryûhei Matsuda, and Hiroki Hasegawa. It's described as "equally hilarious, thrilling, and profound" and looks like a fascinatingly unique perspective on humanity (and sci-fi) that we don't normally see. I've heard very good things about this and the footage looks excellent. Looking forward to catching this film once it arrives. Three aliens travel to Earth on a reconnaissance mission in preparation for a mass alien invasion. Having taken possession of human bodies, the visitors rob the hosts of their essence – good, evil, property, family, belonging – leaving only hollow shells, which are all but unrecognizable to their loved ones. 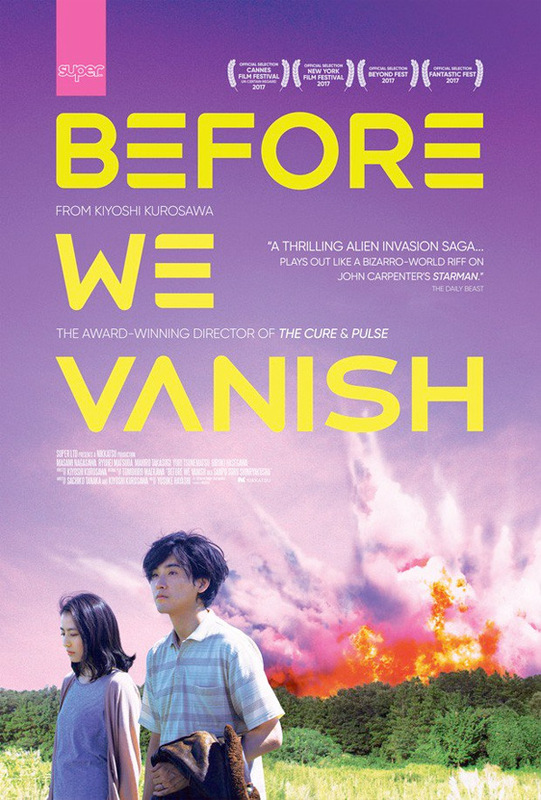 Before We Vanish is directed by acclaimed Japanese filmmaker Kiyoshi Kurosawa, of the films Sweet Home, Cure, License to Live, Charisma, Pulse, Bright Future, Doppelganger, Retribution, Tokyo Sonata, Real, Seventh Code, Journey to the Shore, Creepy, and Daguerrotype previously. previously. The screenplay is written by Kiyoshi Kurosawa and Sachiko Tanaka, based on the play by Tomohiro Maekawa. This first premiered at the Cannes Film Festival last year, and also played at Fantastic Fest and the New York Film Festival. Neon will release Kurosawa's Before We Vanish in select US theaters starting February 2nd this winter. Interested?